﻿ Anessis Hotel Santorini. JIMAT di Agoda.com! Ada soalan mengenai Anessis Hotel? Dibina pada 2004, Anessis Hotel merupakan tambahan menarik di Santorini dan satu pilihan bijak bagi para pelawat. Terletak hanya 0.250 Km dari pusat bandar, para tetamu berada di lokasi sesuai untuk menikmati tarikan dan aktiviti di sekitar bandar. Bagi anda yang ingin pergi agak jauh, Letusan Minoan, Regional Health System Health Care Center of Thira, Thiras Art Gallery merupakan beberapa daya tarikan untuk pelawat. Anessis Hotel menawarkan perkhidmatan yang sempurna dan semua kemudahan penting untuk menceriakan pelancong. Ketika menginap di hartanah yang indah ini, para tetamu boleh menikmati Wi-Fi percuma semua bilik, daftar masuk/daftar keluar ekspres, simpanan bagasi, Wi-Fi di tempat awam, tempat letak kereta. Tetamu boleh memilih dari 13 bilik, semuanya yang akan memberikan suasana ketenangan dan keharmonian. Senarai lengkap kemudahan rekreasi boleh didapati di hotel, termasuk tab panas, kolam renang terbuka, taman. Apa juga tujuan lawatan, Anessis Hotel merupakan pilihan yang terbaik bagi penginapan anda di Santorini. Very helpful staff. Cut through public carpark and this will get you to main bus station in less than 5 mins. Walking distance to central Fira. Clean and comfortable. Hotel is within 10 mins walk from bus terminal. Very convenient and away from the crowd. Staff are very helpful and informative. We had a room with balcony where we can see sunrise. The swimming pool is a plus. Value for money. Great place and super convienent to the bus station. Loved the place and great breakfast! Just had a wonderful 5 night stay in this very friendly B&B. A great location just minutes from the main town handy for the bus station yet nice and quiet. We had a great sea view through the olive trees from our room Also a very nice swimming pool to relax around after a day's sightseeing. We were made to feel part of the 'family'. Will certainly say here again next time we stay in Fira. Loved the hospitality with great breakfast! It's also good for couples that wanna get some local ingredients to do some cooking! it was a ok , not to the level that I expected , the pool seems a distance away from the apartment which I don't even feel like walking over , toilet flush spoilt as it sounded the whole night long , I have been staying there for 3 nights yet it was not being repair . Was facing difficulty during check in time , they do not have a front desk as our ferry delayed , so we arrived pretty late at night which is around 9pm plus , we can't check in as the front desk are all closed , called but no one pick up , lucky enough that we went to the opposite apartment, the owner help us to contact Anesis Hotel Owner than only we managed to check in . A penny of advice , do call to confirm your check in time before you arrive . Owner speaks limited English but he felt so guilty as we are not able to check in , so he took us around and show us the area with his car after we settle down . It was good! Simple but clean, spacious self contained room. Kitchenette would be more useful if it were better supplied with utensils and cooking implements. Making anything in it was challenging. We were quite dissapointed with it. Didn't even have a toaster or kettle. If they improved this, I would definitely reccomened staying here. If you're not worried about cooking then this is a well located hotel. Close enough to walk to the main area but far enough away that noise isn't an issue at night. This place is great, just what I was looking for. A small family run hotel close to the heart of Fira and and the bus stop. The manager was very friendly and helpful and I had a great stay. Nice swimming pool also, would love to visit again. It's quiet especially night time, feel peaceful. 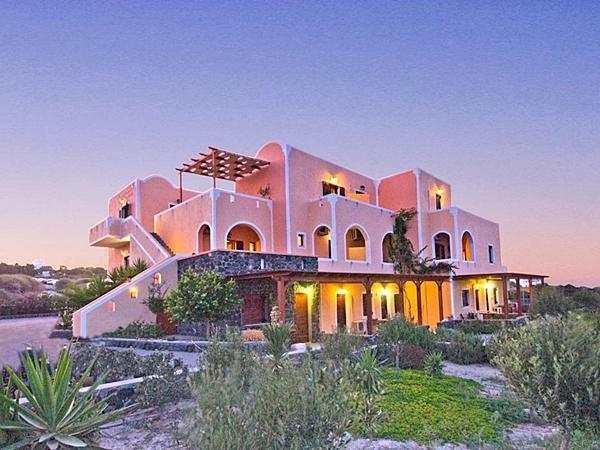 i stayed for 2 nights at this lovely place, and it was a great time in santorini island. it's out of center actually, but just 5 minutes walking is enough to get to the center. and night time is very quiet, so you can relax and feel peaceful. the place was clean and very comfortable like staying at home. owner was kind and heartwarming. i would recommend this place in santorini island.